Since 1976 the Moto Guzzi Le Mans has been a well-known machine worldwide as a cafë racer, endurance racer, and all around sport/sport-touring road bike. Diehard Guzzi enthusiasts expect the Le Mans to be fast, stable at high speed, dependable, and a little slow steering. The new Le Mans won't disappoint in any of these areas, and has some significant improvements over past models. The V11 Le Mans Tenni, or Tenni for short, is a limited production model that so far has only been made for the 2002 model year. It differs from the standard V11 Le Mans with a satin finish, silver and medium metallic green paint scheme reminiscent of the dustbin faired V8 and 350 racers. The Tenni's side plates are red anodized instead of aluminum color and it has a white sticker number plate on each side of the fairing. Mechanically, the Tenni has a lightweight single-plate clutch, titanium nitride coated forks, and carbon fiber silencers. It also comes with two seats, one black vinyl and another brown suede. The suede seat creates a nice smell in the garage and is quite comfortable, however it won't be going along on many cross country trips for fear of water absorption and a soggy bottom in the rain. These additions to the Tenni are had for $1300 or so more than the standard V11 Le Mans, a good buy if you ask me. The Tenni shares the rest of the specifications and components with the standard V11 Le Mans: hydraulically-actuated clutch, 6-speed transmission, 40 mm hydraulic Marzocchi USD forks adjustable for compression/rebound damping, 91 hp/72 ft-lb torque engine, four differential-diameter caliper front brakes with 320 mm floating rotors, stainless steel exhaust, double u-joint drive line with floating rear drive (vented), 17 midnight blue cast Brembo wheels shod with 120/70 rubber up front and 180/55 rear, and the latest Magneti Marelli/Weber digital electronic ignition/fuel injection. The rear suspension has a single shock, adjustable for preload and rebound/compression damping; on the Tenni this is a gas charged Sachs-Boge unit. The rear swingarm is a reinforced, oval and rectangular section steel member. Reportedly, there are 100 changes between the 2000 V11 Sport and the 2002 V11 Le Mans. Some of the more obvious ones include revised steering head geometry with a reduced rake angle, longer wheelbase and swingarm, and added rear frame brace, attaching to the bottom rear portion of the engine. The clip-on handlebars are also wider, slightly raised, and almost without vibration. My first riding impressions of the Tenni were formed on the roads around Prescott, Arizona, an area with tight curves aplenty. 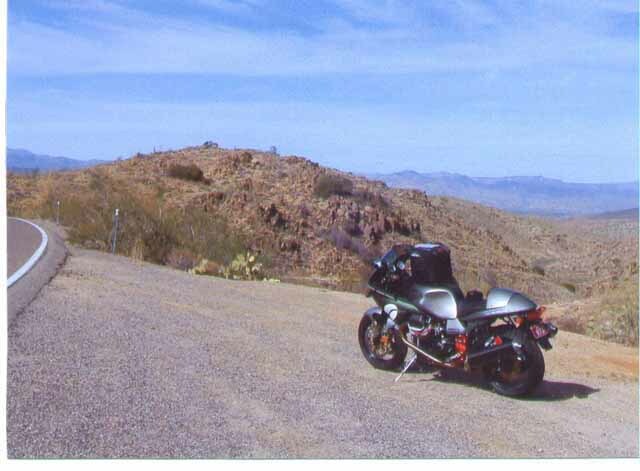 In fact, we headed out to Skull Valley, then back to Prescott on US 89 after dark. After that ride I felt like Marco Melandri in the 250 World Championship Road Racing winner's circle! In fact, I think I could've just taken a nap and let the bike ride itself through all those 20-mph curves. Really though, the Tenni is a 550-lb bike that feels and handles like a 450-lb bike. The steering is so quick and precise, the front end is so planted, and overall the bike is so stable that it's very confidence inspiring. When I was running a little too fast in a slow curve, I just leaned it over a little bit more and tightened up my line. On my '89 Le Mans in that situation I would've been hanging off and/or hitting the brakes. To date my road speed is still limited by an engine break in rev limit, but I have not experienced instability up to 100 mph. From what I hear, others have not up to the top speed of 140 mph. Besides handling, the next most impressive aspect of the Tenni is the single-plate clutch and 6-speed transmission. I can literally fly through the gears, limited only by my own physical ability to pull in the clutch lever and move the shifter. I think if I wanted to I could one-finger clutch, but using two or three fingers is most comfortable. Shifting is light and precise, and lever throw is reduced over the previous 5-speed, but still with a `solid' Guzzi feel. First gear is adequately low and the clutch forgiving to ease pullaway from a stop, and all the gear ratios are close together. I think gears are about 500 rpm apart. With the 5-speed transmission it seemed like first gear, or low, was rather tall in ratio, with second through fourth close enough together, then fifth was like an overdrive, again with a tall ratio. To date I've yet to get a false neutral, miss a gear, or have the neutral light tell me a lie. The brakes on the Tenni, like all triple-disk Guzzis of late, are a no-brainer. When you need to stop, you just stop. The front master cylinder is improved over the one on the 1100 Sport/Daytona/Centauro: it's more solid and gets hard farther from the bar. It too could probably be operated with just one finger, but using several feels better. The rear brake works well, but does not have as solid a feel as the front. The front and rear brake circuits of all Guzzi sport/sport-touring bikes have been unlinked since the 1000S. Only the stock triple-disk `standard' or `touring' models of today (except the Quota) still retain the revolutionary Guzzi integrated brake system. For me this means I'll have to practice for a while to keep from locking up the rear wheel. The Tenni's suspension has a nice feel, and I've had to reduce the damping at both ends a little. I've left the preload in the factory position on the rear shock. I like a bike to have a firm, controlled ride, but not jar me on sharp edged bumps. The Tenni delivers in this regard. Power delivery and throttle response are both very good with this bike, and throttle response feels somewhat softened from previous EFI Guzzis. This doesn't affect performance necessarily, but gives a smoother feel from the engine and steadier throttle. I have not detected any severe flat spots or poor running engine speeds up to 7,000 rpm. The engine is so tractable that you must be careful not to let the engine speed fall too low. I did this at first, transitioning through several slow curves; I let the revs drop to 2,500 or so and didn't feel any lugging or shuddering. When the road straightened out a little I glanced at the tach and realized I needed to drop a gear. The factory has moved the engine temperature sensor from the left-hand valve cover to the right-hand cylinder head, resulting in better mixture control at cooler ambient temps. Fuel mileage should also increase as a result of this change. Since passing 600 miles I haven't gotten less than 40 mpg, and on one tank running 80-90 mph indicated with a little wind I got 44 mpg. With at least 40 mpg and a claimed 5.5-gallon gas tank I should be assured of at least 200 miles between fuel stops, although I don't think I've put more than about 4.5 gallons in it so far. I've been going another thirty or forty miles after the fuel light comes on when 3.5 gallons are gone. On the highway the speedometer is about 5-7 mph optimistic, but the odometer and trip meter are spot on, based on several checks with highway mile markers. My Tenni came with Bridgestone BT 020 tires, which have good feel and grip. I haven't quite used all the tread I've got yet, perhaps I'm close on the right side of the rear, but I'll take it easy as far as that goes. I'll spend about a year getting to know this bike quite well before it or I reach our riding limits. For me the riding position is just right, what I'd call a classic sport touring position, and I'm about 6'1 tall with my boots on. You sit with your legs below you, knees bent at about a 45° angle, slightly leaned forward, with hands set relatively wide and a few inches above your knees. I've already covered 430 miles in a day and I didn't hurt anywhere, so 600-800 miles/day should be attainable. As expected, the fairing provides upper and mid body protection without any wind buffeting the rider's head. All of the bodywork on the Tenni is plastic, and I'm not sure if any of it is painted. It appears to be just molded, so there may not be any paint. The engine, transmission, and rear drive are painted a gritty, bedliner black, and that's just what I'll use to touch it up: black truck bedliner paint from NAPA, assuming it'll need it. I wasn't too sure how I would feel about having a plastic gas tank, fairing, seat cowling, etcetera, but ABS plastic shouldn't ever crack, rust, or dent, and the automotive industry has been using plastic fuel tanks for ten years at least. Problems so far after 1400 miles? Only very minor ones. There was a little oil that blew onto the right side of the bike during the first 70 miles or so. We think this came from the lower cylinder head nut recess. I found an intake boot clamp that was loose on the left side and tightened it. Once it started getting below 30°F at night the bike was hard starting with 20W50 petroleum based oil in the sump, so I dumped that for some 10W40. Now it fires right up when it's cold. After ten minutes of trying to lock the steering in the parking lot of my hotel in Lake Havasu City, I discovered that despite the PUSH lettering on the ignition switch it was not necessary to push to turn the switch to the left and lock the steering. I had to endure a minister and his entourage coming up and asking me how fast I'd gone on my new Moto Guzzi so far. After a pause and a stare I told them an indicated 95 because the engine is breaking in and has a rev limit. Would I change or add anything? Of course. 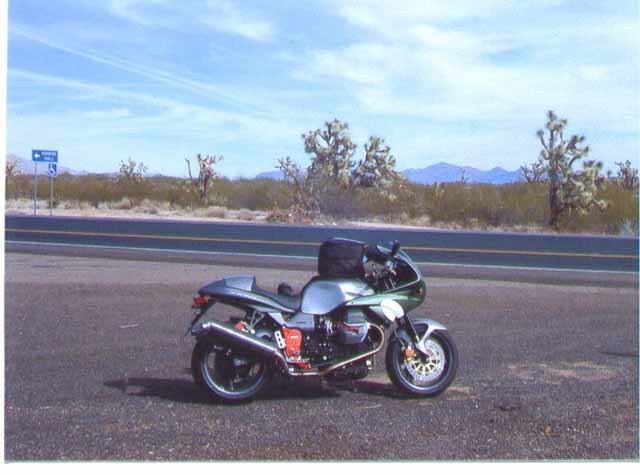 Being a pragmatist I desperately mourn the loss of the center stand on today's sport oriented motorcycles. Why can't I go fast, save weight, and be able to easily work on my bike? Even though the lights seem bright enough and work well, I'd like to have a 520 W alternator instead of the 350 W one I've got. I know Ducati makes one because that's what my wife's bike has. I usually let her lead at night so she doesn't blind me with her `lighthouse' headlight that's as bright as our pickup trucks. Let me just say that as far as the bikes go, the Aprilia hand is working magic over there in Mandello del Lario. Bravo Guzzi! Tenni along Arizona Highway 96 between Hillside and Bagdad. Tenni along U.S. Highway 93, the 'Joshua Forest Parkway! 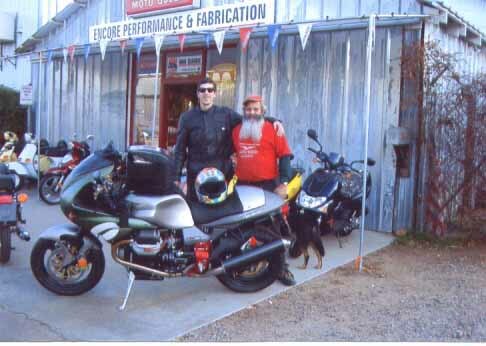 Tenni just purchased from Jim Knaup at EP&F Guzzi in Prescott, Arizona. Jim's probably one of the best dealers in the U.S.